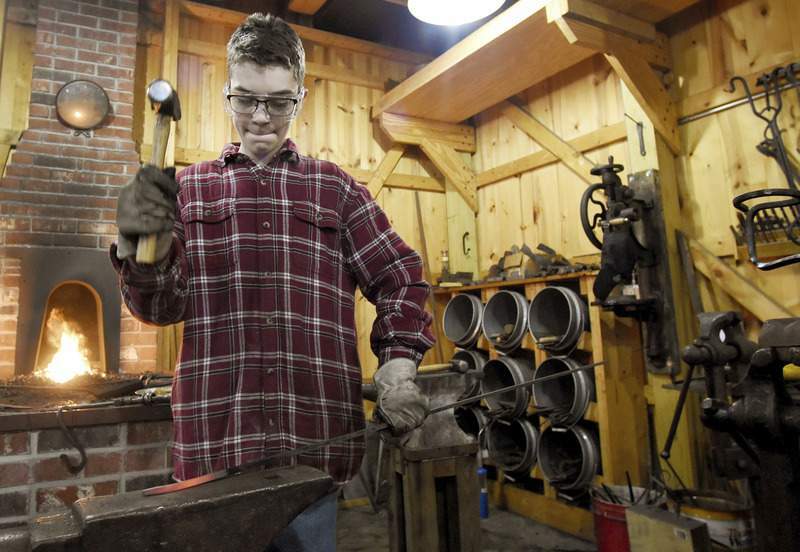 Rachel Von | The Journal Gazette Grant Holman, 14, works on hammering into a cup holder he is making in order to sharpen the point that he will be giving as a Christmas gift during the Christmas on the Farm event at Salomon Farm Park on Saturday. 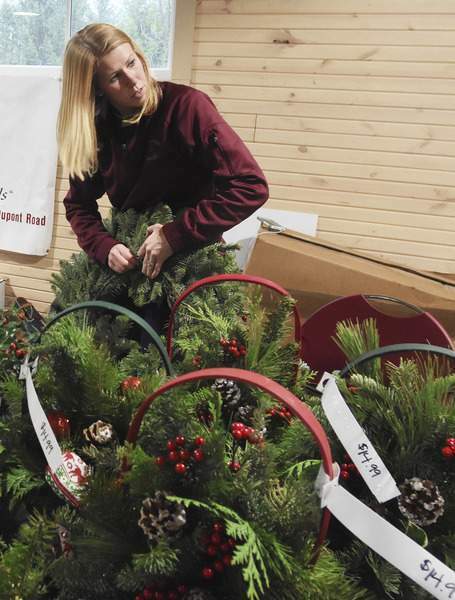 Rachel Von | The Journal Gazette Amy Henry, with Arbor Farms Nursery, works on preparing greenery for sale in the vendor market during the Christmas on the Farm event at Salomon Farm Park on Saturday. 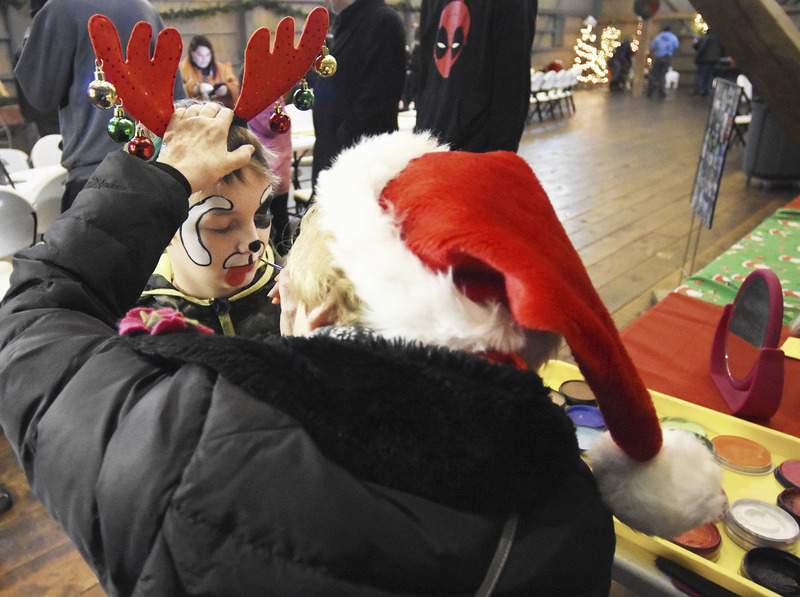 Rachel Von | The Journal Gazette Jonathon Ballard, 11, gets his face painted by Myrna Kendrick with "Let me Entertain You" during the Christmas on the Farm event at Salomon Farm Park on Saturday. 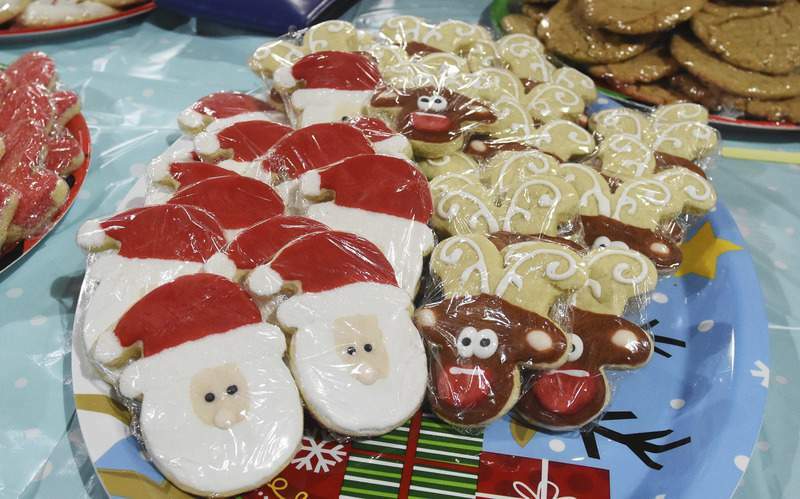 Rachel Von | The Journal Gazette Christmas cookies are decorated and sitting on the Cookie Nook's table at the vendor market during the Christmas on the Farm event at Salomon Farm Park on Saturday. The event featured blacksmith demonstrations, a vendor market, children's activities, live music, Father Christmas, and more. 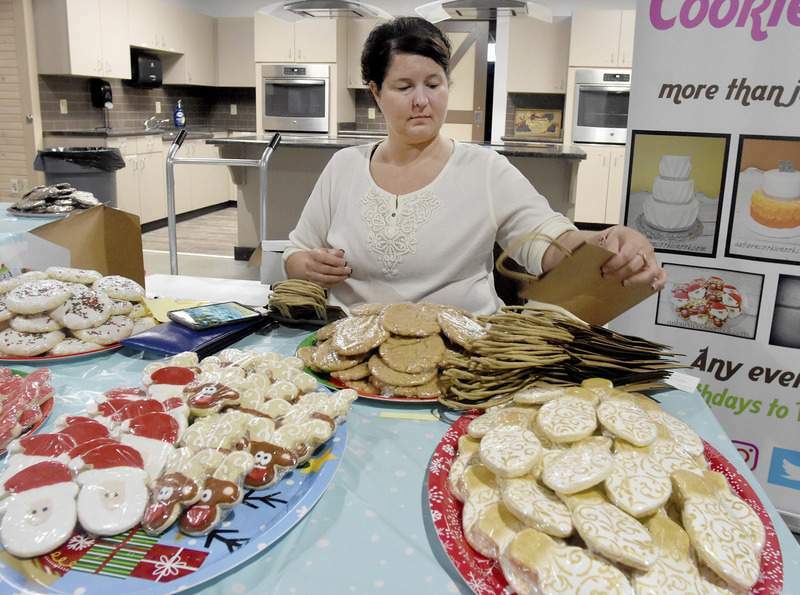 Rachel Von | The Journal Gazette Michelle Noe, with Cookie Nook, works on labeling bags at the vendor market during the Christmas on the Farm event at Salomon Farm Park on Saturday. 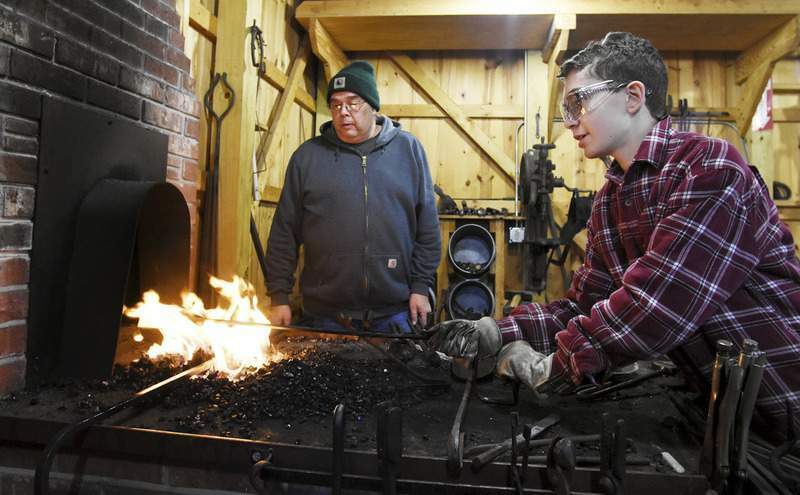 Rachel Von | The Journal Gazette Grant Holman, 14, right, makes a yard cupholder over the fire that he will be giving as a Christmas gift as his teacher John Wooten looks on during the Christmas on the Farm event at Salomon Farm Park on Saturday. 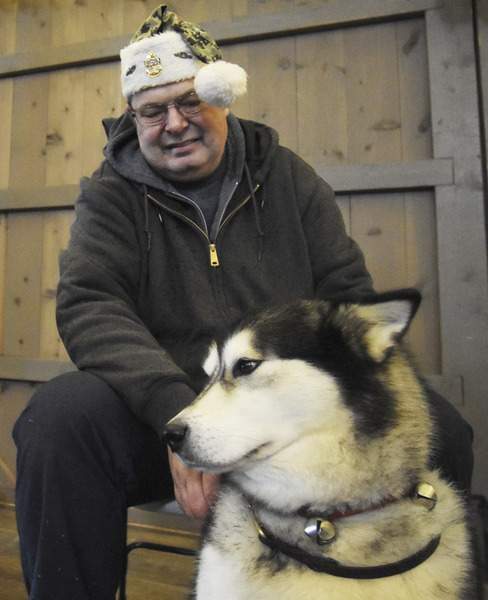 Rachel Von | The Journal Gazette Sean Dreer sits with Tori, an Alaskan Malamute, who is a therapy and hospice dog owned by his wife Belva Sutton-Dreer (not pictured) through Tarnish's Kennel during the Christmas on the Farm event at Salomon Farm Park on Saturday.